Integrating with many Magento extensions like SM Image Slideshow with smooth transition effect, Vertical Mega Menu with multiple columns and static blocks with nice image. SM Categories helps you show many categories with display image. Static blocks with nice images and texts bring helpful information about your store. Layered navigation Ajax, Ajax cart pro extension help customers purchase more quickly, multi-language, multi-currency, brands slider, product hover effect and so on. -Include extensions: SM Shop By, SM Quickview , SM CartPro , SM Basic Products, SM Mega Menu , SM Image Slider, SM Deal, SM Search Box , SM Super Categories. 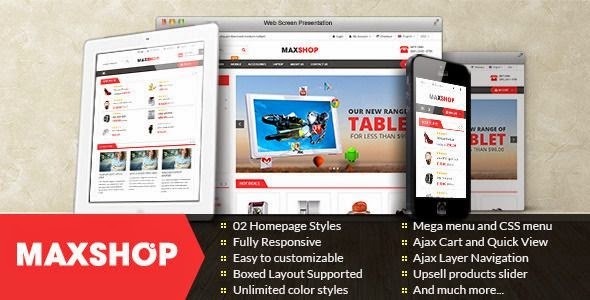 Item Reviewed: Maxshop Great New Multipurpose Magento Theme 9 out of 10 based on 10 ratings. 9 user reviews.